A new documentary on Tehri Dam, released in Delhi, has strongly raised the pitch in favour of dam free rivers, even as focusing on human and ecological crisis in the Himalayan region after the construction of dams such as Tehri, allegedly ruining the lives and livelihoods of local communities. The documentary also highlights “irreparable” damage to ecology, environment and cultural values which were there for centuries. Made by Narmada Bachao Andolar (NBA) activist Vimalbhai, and titled ‘Tehri 2015 – The Ten Years of Injustice’, it gives an account of “illegal” and “forced” land acquisitions, “violations” of environmental safety norms and “unfair” rehabilitation of displaced families that are still seeking justice even after 10 years of its commissioning. 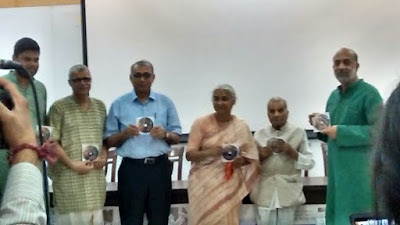 Inaugurated by Justice Rajinder Sachhar, known for his minorities commission report of 2005, a function at the Constitution Club also saw the release of the book ‘Why Dams?’ by Vimalbhai, published by the National Alliance of People’s Movements (NAPM). The book documents years of work done in dam affected regions of Uttarakhand and discusses the environmental degradation, displacement and loss of livelihoods of the people owing to building of large dams. “Till now the problems arising in the Uttarakhand and Ganga Valley due of a large number of small and big dams has been overlooked for the unjust greed of electricity”, said Vimalbhai. He said the Namami Ganga initiative of the Narendra Modi government talks “only about pollution and cleaning the River Ganga but runs away from issues raised by the construction of dams on Ganga.” Senior advocate Sanjay Parikh, fighting cases for people on Tehri Dam since 1992, was felicitated on the occasion. “The government is playing a very dangerous role in diverting the people’s attention and defaming the real struggles to facilitate the natural resources in the hands of industries and rich people”, Patkar said, insisting that time has come not to “aspire for legal justice but for human Justice”.